For people working in the water-challenged areas of Bihar and Jharkhand in eastern India, it’s virtually impossible to avoid certain questions. How do families staying in flood-prone areas, contaminated-groundwater areas, drought-affected areas and water-abundant and water-scarce areas survive the consequent effects? The clues lie in understanding the lifestyle of the people living in these areas, which is sometimes best recounted by capturing images across seasons. These photographs often bring forth how preparation and confrontation of a challenged environment is initiated at the household level. The realisation that households are the basic unit of adaptation to climate change leads to another nagging question: who in the family shoulders the main responsibility? This photo journey has minimised the misleading generalisations about roles and responsibilities within the households across the different phases of disaster — before, during and after. It is a sharp realisation that women, children and the elderly experience the entire sequence of the challenging environment and, since they are generally on their own (due to the dominant trend of migration among men in the region), the women and children are solely responsible for developing relevant safety mechanisms for the survival of the household. A boy in Chhatapur village in Supaul district of Bihar tries to keep himself and his family entertained by clicking photographs of boats ferrying relief material and people. The inundation was due to a breach in the eastern Kosi embankment in Sunsari district of Nepal. Boys overcome the problems of contaminated and scarce water by collecting drinking water from a damaged pipeline. Despite a flood warning because of a massive landslide in Sindhupalchowk district of Nepal in 2014 that blocked the flow of Sunkoshi River, children of Teghra village in Saharsa district of Bihar make the most of it. Most men migrate out of Bihar’s Supaul area in search of work, leaving women and children to prepare for the flood season. A child joins the movement out of the eastern Kosi embankment area in Baluwaha village in Saharsa district of Bihar. A child accompanies his mother at Sounmanki Ghat in Khagaria district of Bihar. Multi-tasking seems to come easily to the women and children, but little thought is given to the fact that they lack consistent support. The Hasa Nauabhakhar village in Supaul district of Bihar is inside the Kosi embankment that is flooded every year. Women of Ramnagar village in Pashchim Champaran district of Bihar sit on an upturned boat during the monsoon and flooding season. 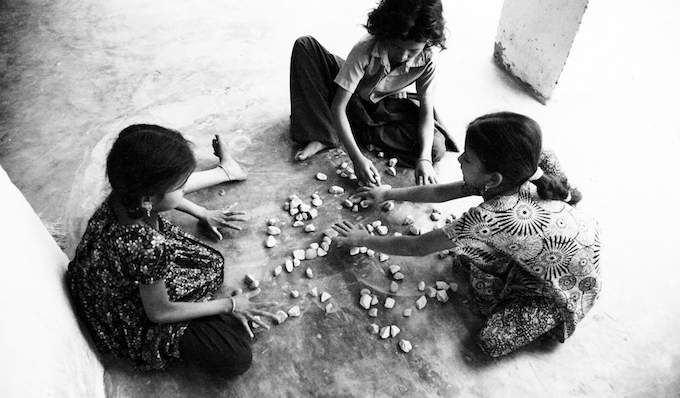 Girls at play in Rupwaliya village in Pashchim Champaran district of Bihar during the flash floods in 2014. A boy drags wet hay through water in Phulparas village in Madhubani district of Bihar. Children play an important role in making the family secure during floods. The numerous challenges they face while doing that usually go unnoticed. Excellent set of photographs and documentation. Thank you. Very evocative pictures. The pictures of the kids are really touching!